The Ants and Their Garden information graphic is used as outreach material by myrmecologists (ant experts) at the Smithsonian Institution. It was developed to show in a snapshot the complex social system of leafcutter ants and their process of cultivating plant matter to maintain fungus garden that feeds the entire colony. 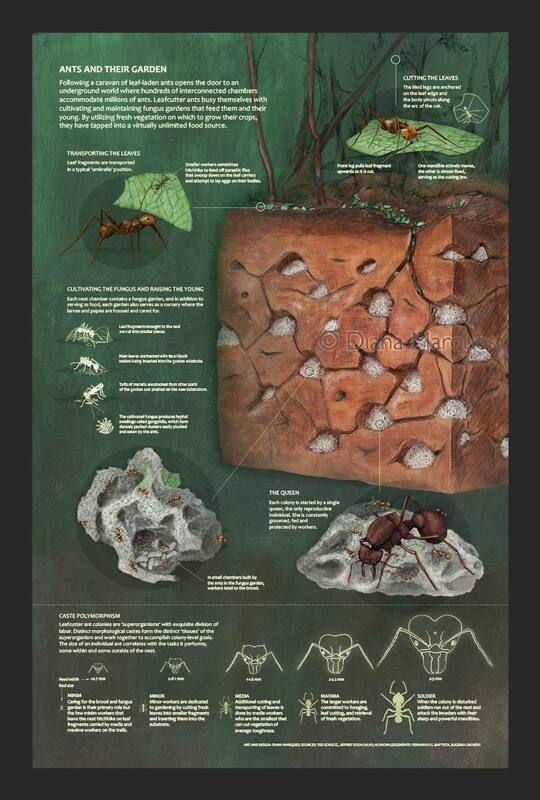 The different steps in this image illustrate how leafcutter ants harvest the leaf fragments, carry them into the nest and then plant them to grow the fungus gardens spread across the many chambers of the nest. The continuity of the colony is maintained by the queen, the only reproductive individual, and the many workers that tend to the brood. This information graphic is still subject to changes, more information will be added and an interactive online version is under work.